Mon mari is out of town for the next few days. 48 short hours of singledom to reacquaint myself with all of the things that drive him crazy. For one, the recovering theatre major in me cannot help plugging in the Rent soundtrack over the surround sound speakers. Learning young from the intolerance of the men in my family, Broadway musicals and the Mariah Carey Christmas album are two genres of music that must only be listened to in private. Once I’ve got something to belt along to and rehearsed my boxstep, I will spread out all of my drawings all over the floor of the apartment. A bird’s eye view is always best. Then I will eat a big green salad full of the things he cannot tolerate. Beets, avocado, cumin, cilantro and birdseed to my hearts content, while singing “La Vie Boheme” with my mouth full. 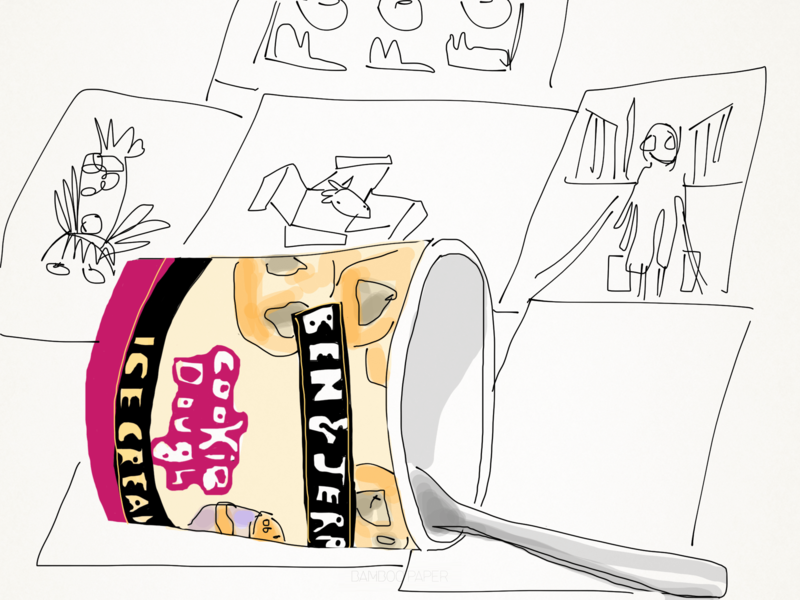 I must not forget the Ben & Jerry’s. If I eat the whole thing, no one will ever know it existed. Rent is transporting me back to Philosophy 101. The rest of the evening will be wrapped up with a belly ache and a Woody Allen marathon. A little late night Kate Bush impersonation hour and I’m off to bed. And then I’ll text mon mari to come home ASAP. ‘Tis the season. I think Mariah Carey could be forgivable this time of year. Ohh yes, out of town…..I absolutely LIKE. That way I can indulge in my little peché mignon, reading very late, um til midnight? 1 am?, instead of having someone grumble next to me, “chérie, it’s so late already, can you switch off the light??!”. When I woke up this morning, I noticed wine stains all over last night’s drawings. Wine glasses never tolerate fist pumping. Pardon my Franglish, but bon dimanche. Ha! Thank you Cynthia. I was about to propose the same to Heather. You made me laugh out loud! I needed comic relief after cleaning out the frig. You and Heather need to get together and compare notes, but then the notes would be almost identical .